I am writing this 2006 Burgman 400 review after having owned and ridden my Burgman for years! For starters, the 2006 Suzuki Burgman 400 has a lit underseat storage compartment that accommodates two full-face scooter helmets and three front compartments with lids for smaller items. The Burgman 400 has a stylish design that's guaranteed to capture the spotlight wherever you ride whether it's just around town or on longer trips riders will appreciate the plush suspension, matched by the aerodynamic fairing which gives excellent protection from the wind. 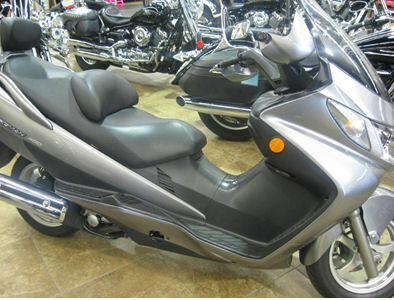 This Suzuki scooter is definitely for riders that are looking to to turn some heads and enjoy a ride of exhilarating performance in comfort. The 2006 Suzuki Burgman 400 has a stepped seat and an easy to adjust backrest for the rider and there is also a passenger backrest that provides comfortable seating for everyone on board mile after mile. Plus the roomy concave floorboards will give both you and your passenger plenty of leg room. The 2006 Burgman scooter has a liquid-cooled engine, an advanced fuel injection system, an automatic clutch and V-belt drive for smooth, even power delivery. Just looking at this bike you know that the 2006 Burgman 400 scooter is ready to add some style, organization and excitement to your life! If you have any questions regarding any of the motorcycle reviews posted on provided by GoGoCycles Used Motorcycles for Sale you are welcome to post them in the comments section below. GoGoCycles would also encourage our friends to submit their own reviews of the 2006 Burgman 400 to help potential buyers make informed decisions and to benefit the biker community as a whole. How much are used 2006 Suzuki Burgman scooters selling for these days?